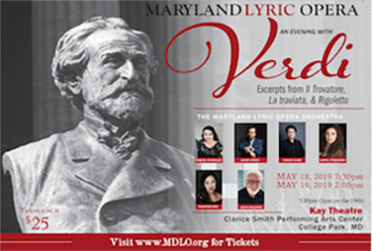 Maryland Lyric Opera presents an evening of excerpts from three of Verdi’s most celebrated operas; Il Trovatore, La traviata, & Rigoletto. 50 members of The MDLO Orchestra join the singers on stage for performances hosted by MDLO Music Director Louis Salemno. Join us as we take you inside these timeless dramas.